Forty years earlier, Salem Village had been in the grips of a witch hunt. Nine-year-old Elizabeth Parrish, daughter of the Salem Village minister, and her 11-year-old cousin Abigail Williams, began to behave oddly enough that a local doctor declared them bewitched. Liking the sound of that and egged on by adults, the girls accuse three women of doing the bewitching. Two of the women professed innocence but one confessed, then pointed to several others. Some of the newly accused, in turn, accused others who, in turn, accused even more. By the time the accusations ran their course, a little over a year later, over 150 people had been implicated, five had died in jail, 19 had hung, and one had died while being tortured to elicit a plea. Eventually, it was acknowledged by all involved that it had been a huge mistake and, to distance themselves from the witch trials, Salem Village changed its name to Danvers. This, the town would come to regret, because the witch trials are now the center of a major tourist industry and that industry is not based in Danvers. The incident is not, after all, called the Danvers Witch Trials. No, they’re called the Salem Witch Trials. So the recipient of all of those witch trial related tourist dollars is the we-didn’t-change-our-name Salem, five miles south of Danvers. In the 17th century, Salem was Salem Town, the larger sibling of Salem Village. To be fair to Salem major, many of the witch trial events did happen there. It’s just that most of the sites associated with it no longer exist. Today, Salem is the home of a lot of broomstick-riding, pointed black hat wearing witch cheesiness. 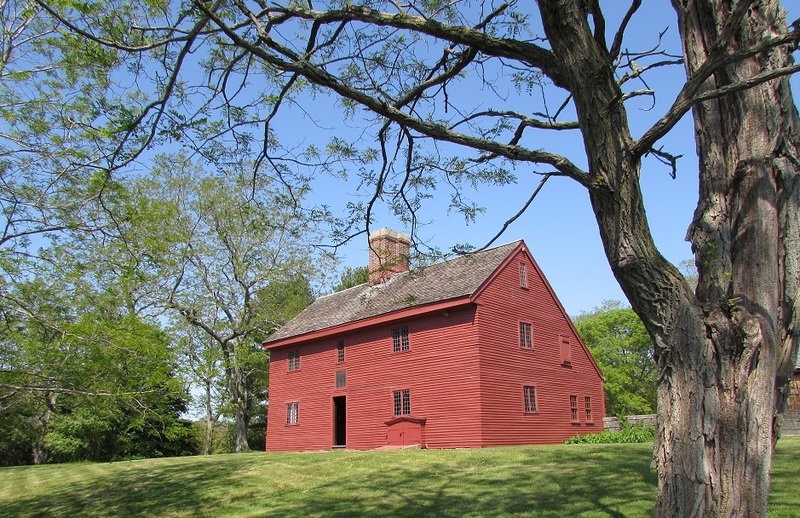 For actual historic sites associated with the witch trials, we headed to Danvers. Our first stop was the home of Rebecca Nurse, one of the witch trials victims. Based on accusations by the Putnam family, she was arrested, tried, found guilty and hung at age 71. It opens for tours at 10 but we got there a half an hour early and was enthusiastically welcomed by the one staff member there at the time. She sent us to the family cemetery while she completed her opening tasks, but said that once that was done, she could take us into the house for an early tour. The cemetery is about a quarter of a mile from the house, via a mowed path. Rebecca Nurse is buried there, although no one knows exactly where (there’s a granite monument in the center of the cemetery, dedicated to her). After the witch trial victims were hung, they were tossed in a hole next to the gallows. But the families of several of them, including Rebecca, went under the cover of night and took the bodies for a proper burial elsewhere. 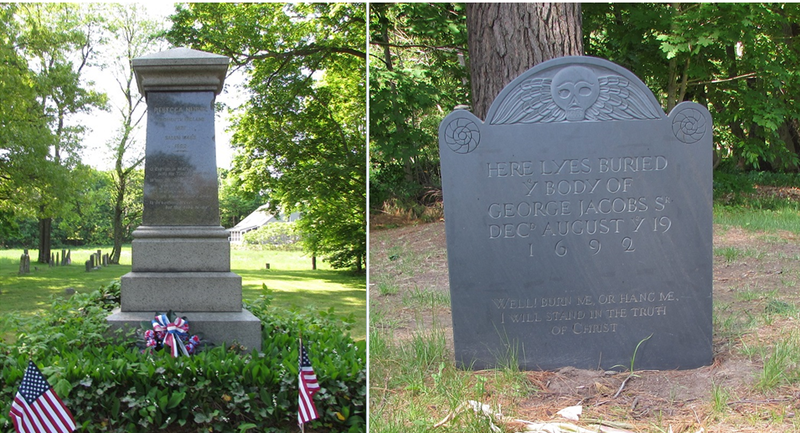 Also buried in the Nurse family cemetery is George Jacobs, another witch trial victim. He was buried on his family property until 1992, when the property was sold to developers and his body was moved to the Nurse cemetery. The house is a beautiful circa 1678 First Period structure and the tour included the entire two story interior. You can take a self-guided tour of the house, but that includes only the first floor. 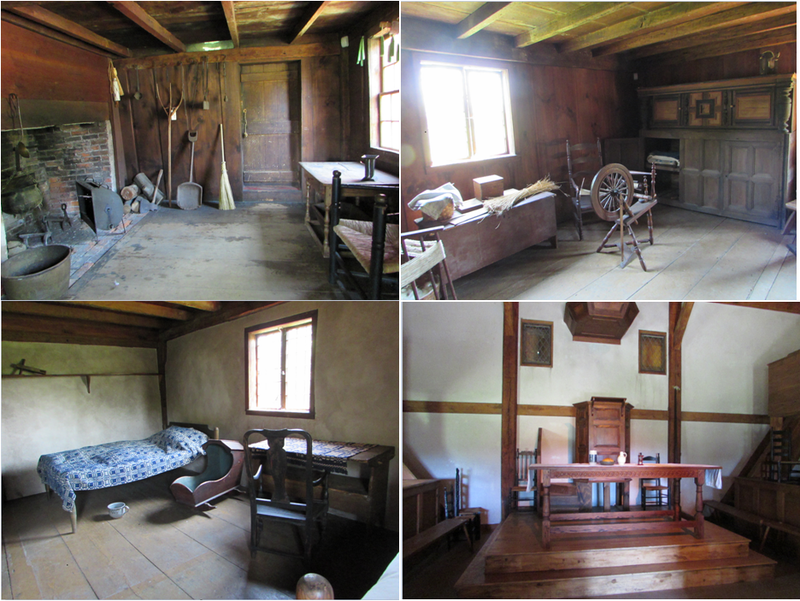 The tour also included a reproduction of the first Salem Village meeting house. It was built in 1984 as a set for the PBS film, Three Soverigns for Sarah, a dramatization of the witch trials. Sarah was Sarah Cloyce, sister of Rebecca Nurse and Mary Easty. All three sisters were accused of being witches. Rebecca and Mary were found guilty and hung. Sarah survived. 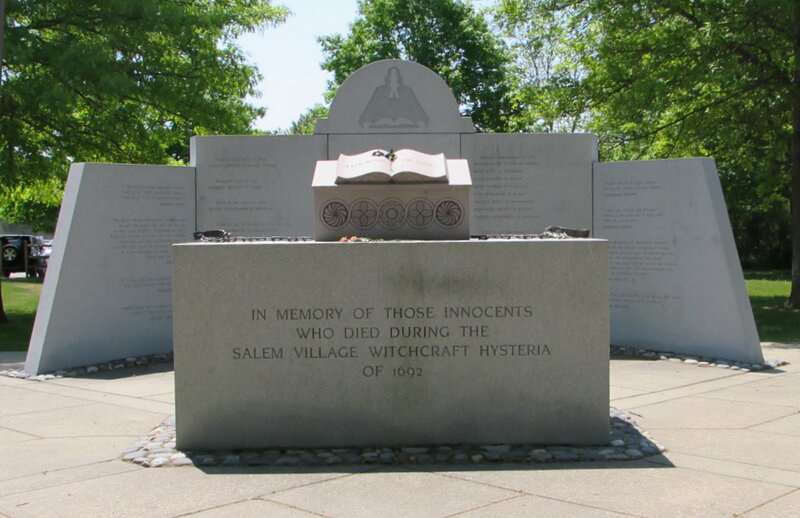 After visiting the Nurse Homestead, we drove a couple of miles down the road to the Salem Witchcraft Victims Memorial, dedicated in 1992 to mark the 300th anniversary of the trials. It’s located across the street from the site of the original Salem Village Meeting House. So what started it? Modern scholarship seems to point to attention seeking (on the part of the girls) and jealousy and avarice (on the part of the adults). Once the accusations started flying, people saw a way of profiting from the accusations, since those found guilty often lost their property. The Nurses were engaged in a land dispute with the Putnams at the time that the Putnams accused Rebecca of witchcraft. And although her lands weren’t forfeited when she died, in an odd twist, in 1784 her great-great grandson would sell the house and lands to the Putnams. What stopped the madness? Influential people outside of their community started speaking out against the accusers’ motives and tactics. And, most importantly, accusers made the mistake of pointing a witchy finger at Lady Mary Phips, wife of the governor. That’s when the governor decided to put his foot down. In May of 1693, Governor William Phips pardoned all those in prison for witchcraft and in 1702 the courts declared the trials unlawful, restoring the good name of those accused – much good that did them. Gallery | This entry was posted in Massachusetts and tagged George Jacobs, Mary Easty, Rebecca Nurse, Rebecca Nurse Homestead, Salem Witchcraft Victims Memorial, Sarah Cloyce. Bookmark the permalink. Thanks for letting us know about Danvers. I will put it on my itinerary when I am next in Massachusetts. You’ll definitely want Danvers over Salem, at least for the witch trial stuff. Have read all the suppositions as to how this happened, including the eating of diseased grain. I think it was the convergence of the puritan religion, which insisted on keeping its members in a state of terror because you never knew if you were ‘saved’ or not, no matter how good you were – along with the medieval culture which actually believed in witchcraft – and the legal acceptance of ‘spectral evidence’ in court. Though even without Puritanism, they certainly murdered a lot of witches in Europe. At least after this episode, the legal community got rid of the acceptance of spectral evidence. Lots of different theories and no one will ever know for sure. Very worthwhile. I thought that the monuments and the modern narrative of the trial victims as “victims” — which of course they were — was particularly interesting.